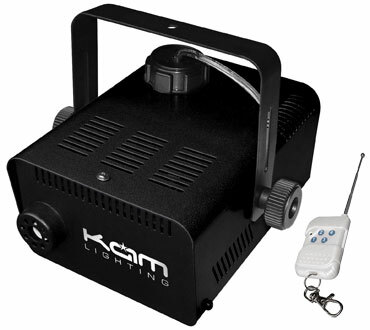 Well-known mobile DJ equipment brand Kam have recently extended their range of smoke machines with the addition of the KSM1100. This extremely compact and lightweight machine features a powerful 1100 watt heater and a large 1.5 litre fluid tank, allowing it to generate 10,000Cu ft/min of smoke. The KSM1100 is fitted with both rubber feet and a hanging bracket, meaning that it can be hung from a lighting stand or simply positioned on the floor of a venue. Boasting a strong metal construction and electronic thermostat control, the professional unit offers a very quick warm-up time and is supplied with a long range wireless remote control and also a programmable timer. With a full SSP of £104.45 (including VAT) the KSM1100 is available now from Kam dealers across the UK and online.